You can obtain information on permanently monumented control points including horizontal control, vertical control, High Accuracy Reference Network (HARN) stations, Calibration Baselines and retrieval software from the National Geodetic Survey (NGS). To plot NGS published control points in Google Earth, you can use DSworld, available from the NGS User Contributed software download page. Download kml files of control points by state, county, and type here. 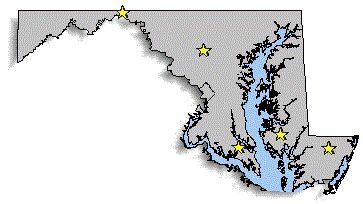 The map above shows the location of High Accuracy Reference Network (HARN) points in Maryland. The position of these points was determined by GPS observations and have a stated accuracy of 1.0 to 0.1 parts per million. NGS published these monuments as part of the North American Datum (NAD) of 1983, 1991 adjustment. The Maryland Department of Transportation State Highway Administration (MDOT SHA) uses these points and this horizontal datum for our existing projects. Future Datums NGS is preparing a new Horizontal and a new Vertical Datum in the year 2022 to replace the NAD of 1983 and the North American Vertical Datum (NAVD) of 1988. This will affect the State Plane Coordinate System of Maryland, as well as the heights, or elevations, that were based on the NAVD of 1988. The system will be called the National Spatial Reference System of 2022 (NSRS 2022). For more information on the new datums click here. MDOT SHA uses mentods from Static Post-processed Global Navigation Satellite System (GNSS), formerly known as Global Positioning System (GPS), to establish survey control points for highway development and system preservation projects. We typically use 1/2" rebar with caps for GPS control points. The horizontal coordinates are in the Maryland State Plane Coordinate System on the North American Datum of 1983, 1991 adjustment (NAD 83/91). The vertical coordinate, if applicable, is on the North American Vertical datum of 1988 (NAVD 88). There is an extensive network of points available for the public surveying community. Download a KML file to plot MDOT SHA GPS Control points in Google Earth or another mapping product (links to the images are not currently available; contact us with a point name and general location and we'll provide the information). The file is available for download here (2.0 Mb). For additional information, contact MDOT SHA Control Points. The map above shows the approximate location of the EDM (Electronic Distance Measuring system) calibration baselines located in Maryland. A calibration baseline consists of a set of very stable survey monuments that are accurately measured using specialized equipment. By comparing their results with the values published for the monuments, surveyors can verify the accuracy of their equipment. Note: the Appalachian Chapter of the Maryland Society of Surveyors installed a new Calibration Baseline in Hancock, Maryland. It has been measured and published. Calibration Baselines in Aberdeen and Hagerstown were destroyed by construction. One or two of the marks in each may remain, but they are unsuitable for calibration. The Calibration Baseline data is available here.